I thought I would have another go at album reviews. I can only get better. The song Starman was my favourite song, about 10 years ago. Whenever I hear it, I’m reminded of my mum driving me between her and my dad’s house. It was probably never played as much as I think, but in my head it was on the tape player every time. I knew a couple other songs from the album, but only live versions from the Reality Tour dvd (Which my mum used to play a lot.) I didn’t know the album at the time, but I loved Starman. Skip about seven years and I’m sitting in my dad’s kitchen talking to my uncle (My mum’s brother) about the cds he has. I have no idea why. Cannot remember. I was sitting there as he handed me album after album, telling me I would like this one, or that ones a classic. Most of them were from when he used to work in a pub and not really his type of music. One of those albums was Ziggy Stardust and the Spiders from Mars. He told me that’s a good album and put it in a pile for me to borrow. From that point Ziggy has been in my favourite album list. I’ve listened to quite a few Bowie albums, but none of them have clicked in the same way. After one listen, I found I knew more Bowie songs than I previously thought. After two listens I realised I liked Bowie a lot more than I thought. And that was it. The album in it’s entirety has been on my mp3 player ever since. I also bought the cd as I’m not a fan of downloading. The whole album is a complete story. 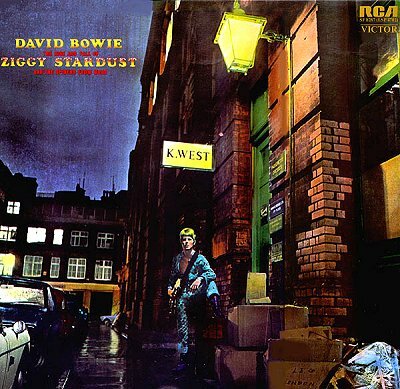 The artwork and each of the songs are connected in the bigger picture of Ziggy Stardust. An alien who has landed on Earth with a quest (Or Kwest as the cover puts it.) of spreading a message about the impending fate of the planet in five years. The first song, Five Years, not only sets up the concept of the album, we’ve got five years, that’s all we’ve got, it is also one of the best opening songs on an album ever. It starts with a slow repetitive drum beat, getting louder and louder, until a piano strikes over it, and then Bowie starts singing. The song is relatively simple for most of it, before getting hectic, desperate and then dies out, leading into Soul Love. Starman is still a great song, but not one of my favourites on the album. I love it for personal reasons, but the rest of the album is much better. Suffragette City is my favorite song on the album, with Rock & Roll Suicide a close second. Suffragette City starts with an awesome guitar riff, and continues into a fast paced rock song. A simple classic. It’s the penultimate song on the album, and works so well as it contrasts completely with the final song, Rock & Roll Suicide. An acoustic guitar, slow riff, Bowie’s vocals. And then other instruments join in, the vocal’s get louder. The song gets going and that desperate tone comes through. The song has the same structure as the opening track and it completes the album. It starts slow and simple and builds up into desperation. Give me your hand, cause your wonderful. There isn’t a bad song on the album. It’s one of the handful of albums that I consider perfect. The only thing that would have made it better is if the song All The Young Dudes, which is one of my favourite Bowie songs, was included. Mott the Hoople ended up with the song. Bowie quickly wrote it for them after they rejected Suffragette City. Bowie later confirmed that the news that the young dudes were carrying was the news of the incoming Apocalypse from Five Years. This album is perfect, and if you haven’t listened to it in full? Then you are truly missing out. This entry was posted in Uncategorized and tagged album review, albums, Author, classic album review, classic albums, david bowie, Music, music review, music reviews, Reading, Review, Reviews, Rock Music, Writing. Bookmark the permalink.